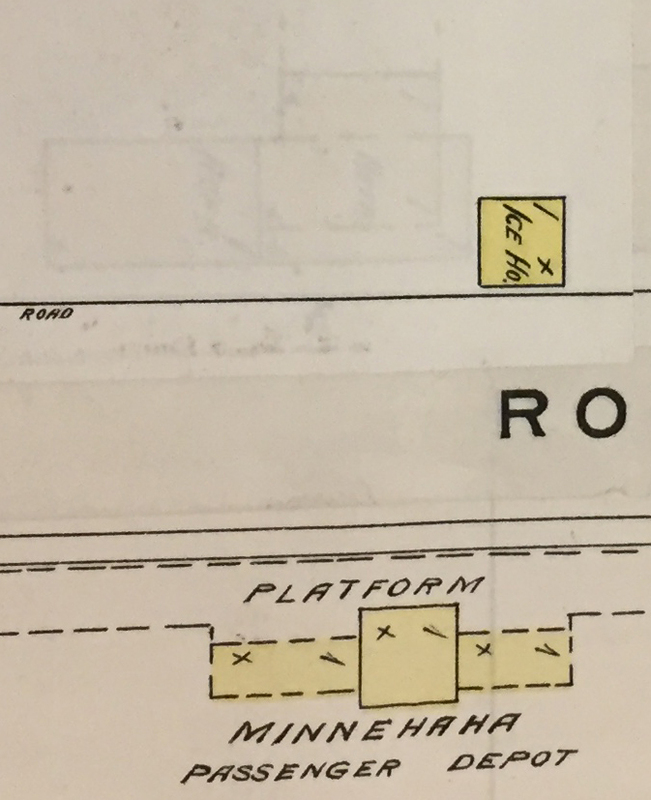 Still looking at this intriguing image, it seems that the businesses beyond the railroad depot appear on a map from the Rascher Insurance Co. that fellow historian Stefan Songstad found at the MNHS library. The original map was printed in 1892, but it was revised multiple times. 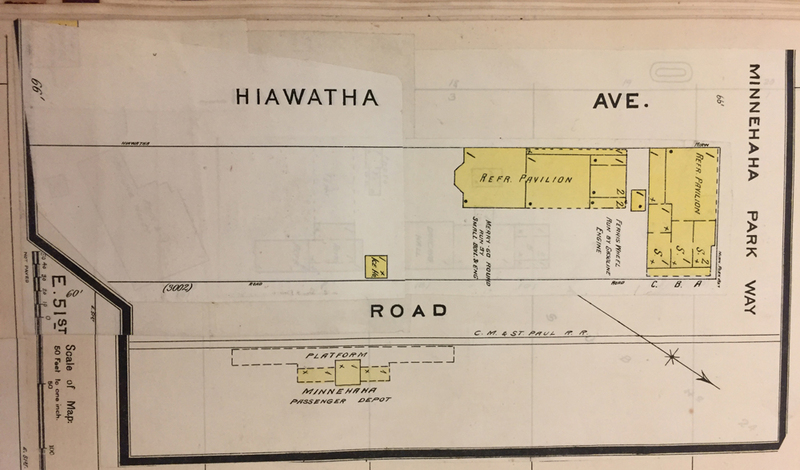 The Rascher Insurance Map showing the strip of land between Hiawatha Avenue at top, and Minnehaha Avenue, not labeled but the western edge of the park. In this orientation north is to the right. –from the MNHS collection. When these old insurance company maps were revised, that meant pasting paper over buildings that were no longer there, and pasting in drawings of new buildings. Reading through the pasted-over papers is a crucial part of this research and it isn’t always easy or even possible. It’s like an archeological dig. A much closer look at the 2 refreshment pavilions located exactly west of the Princess Depot as formerly seen on the Rascher map. The dingy, covered-over rectangles represent 2 or maybe even three buildings. What the map tells us, as we peer through paper and through time, is that there were two refreshment pavilions just opposite the depot, and that each was a single story tall, and had shingled roof. These were next to the easy-to-spot ice house. According to the meta-data on this map at Minnesota Historical Society, these paste-over updates were possibly done between 1904 and 1906. Other buildings removed from the map are surmised to have existed only in 1903 and 1904. So, our black and white photo, which looks through the depot at these places, was taken between 1892 and 1902. But we can narrow down the date of what we see here because, the creation of this refreshment district happened in 1895-1896. The city directories begin to list them as they appear. With a little more work, we might be able to figure out who is standing in that refreshment pavilion, peering down the tracks, looking for the train from Minneapolis and his customers to arrive. Probably the ladies on the bench are waiting for the train, too. 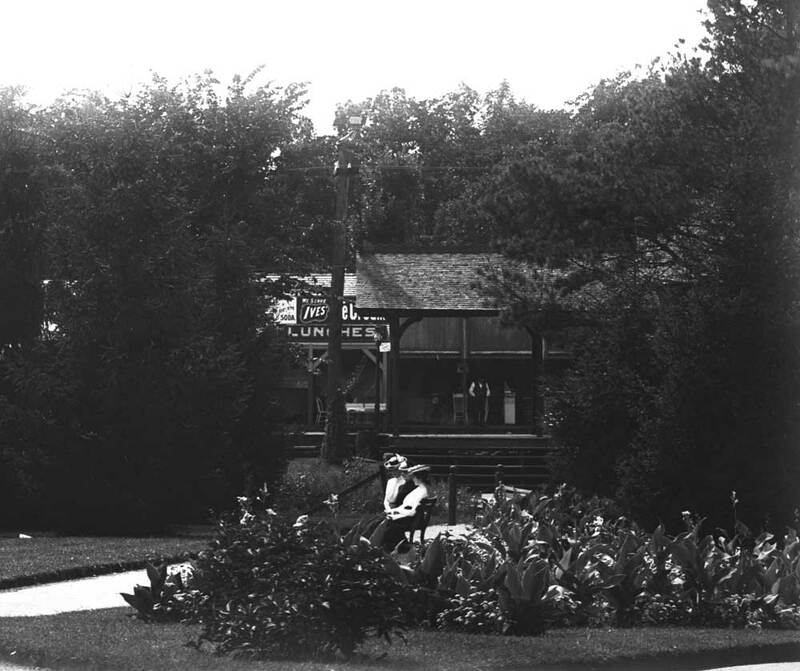 Next Next post: Pavilions at Minnehaha, part 1.